The colonial towns of Tigre and San Isidro make a popular side-trip from Buenos Aires, but most day tours only offer a whistle-stop visit. 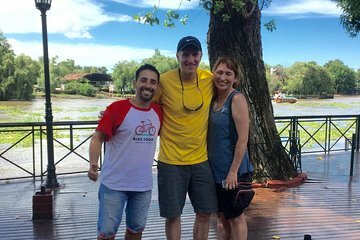 This 6-hour tour by train and bike lets you travel further and immerse yourself in local life, as you explore the historic monuments of San Isidro and the lively market town of Tigre. Meet your guide and small group of no more than 15 people at Círculo Militar in downtown Buenos Aires. After being matched with a suitable bike, follow your guide to nearby San Martin's Square to board the Tren de la Costa train to San Isidro. On arrival, saddle up for a guided bike tour of the historic town, pausing to admire the grand colonial buildings, glide around the riverside park, and peek inside the magnificent Gothic church. Continue by train to nearby Tigre, then set off to bike around the scenic waterways of the Tigre Delta, browse the lively Puerto de Frutos market, and explore the grand monuments along Paseo Victoria, including the Municipal Museum of Art and the historic rowing clubs. After a morning exploring the provincial towns of North Buenos Aires, return to the city, where your tour ends back at Círculo Militar.